“Patchetta” is bold and colourful and tells a wonderful story about wool. 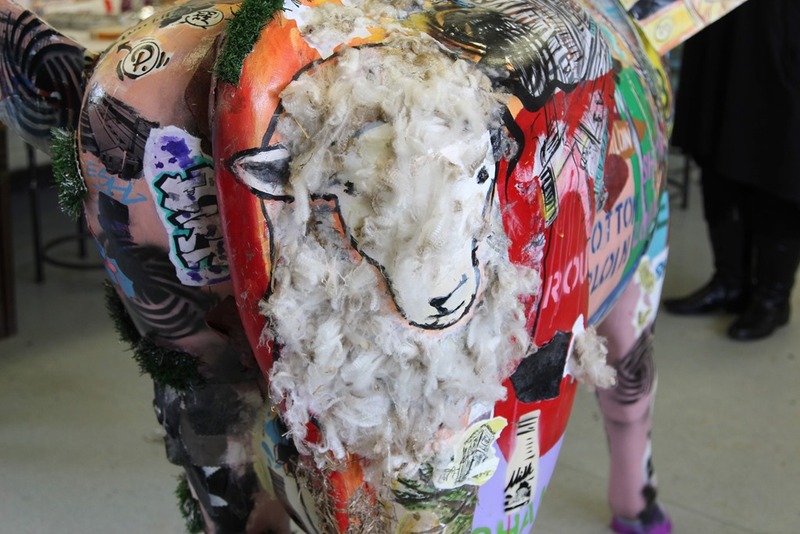 She has multi coloured ‘patches’ with images and information which is relevant to various sectors of the wool industry in Australia. The content of these sectors was driven by the research groups that the class was divided into. 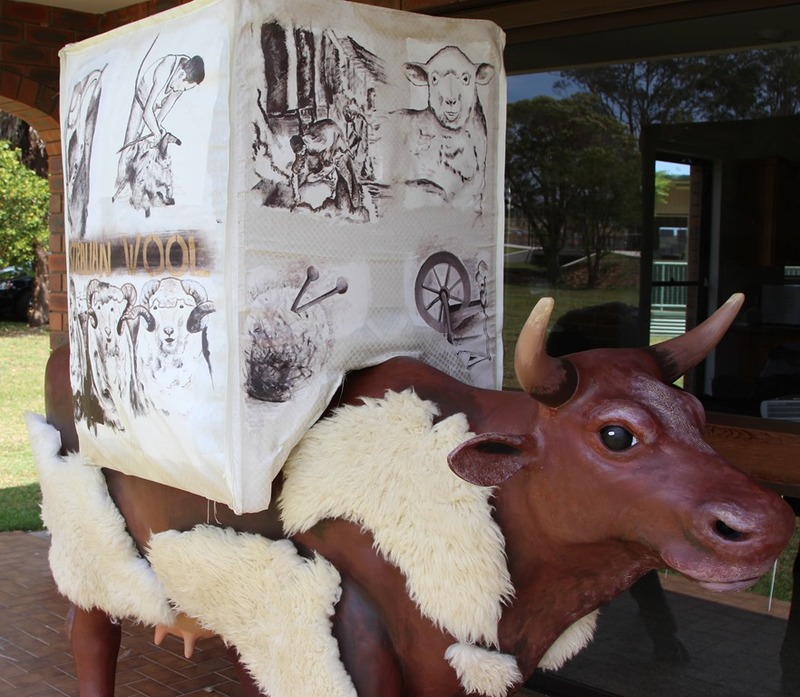 These sectors included: What can wool be made into; Different types of wool; A photo collage; A timeline of the wool industry in Australia; Shearing tools; Different places that sell wool; Fleecy and Woolly facts; and Scarf felting. Each group did their research work, and then designed their own ‘patch’ on “Patchetta” to tell their story. 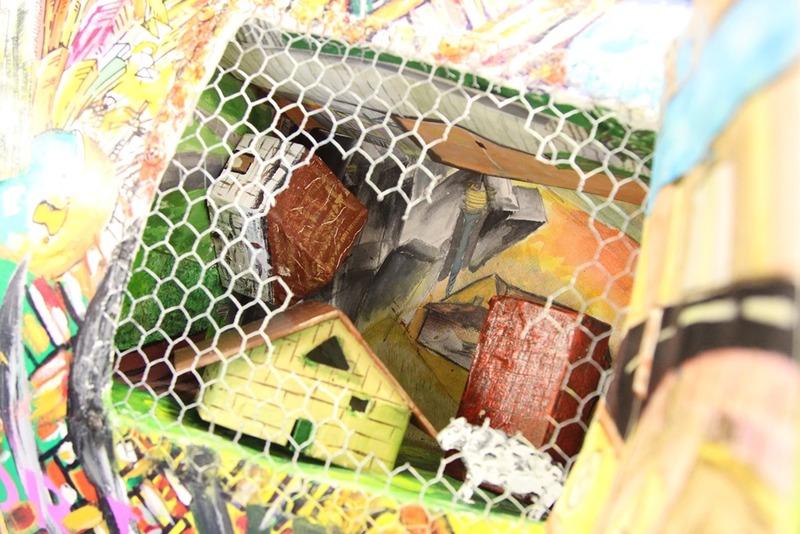 The combination of these patched stories gives a wonderfully complete picture of the wool industry. The felted scarf is colourful, beautiful and very well made! The perfect accessory! “Archibella Milkshake Boo” very much has her own personality. Her unusual name was the result of suggestions from the school community. 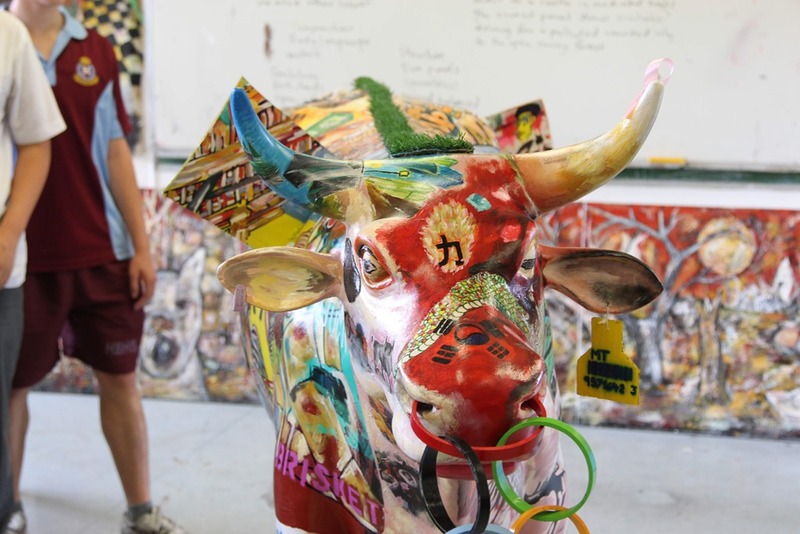 “Archibella” (because she is a female Archibull!) 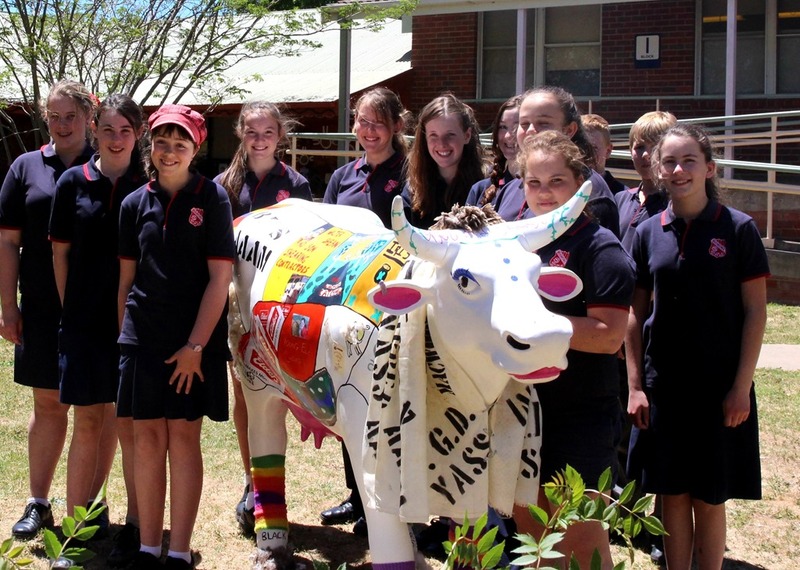 and “Milkshake” were the two favourite names chosen by the school, and “Boo” stands for Boorowa. Her personality shines through everything on her, but particularly is reflected through her makeup and the flamboyant socks (from Crookwell), her scarf and her horn decorations. 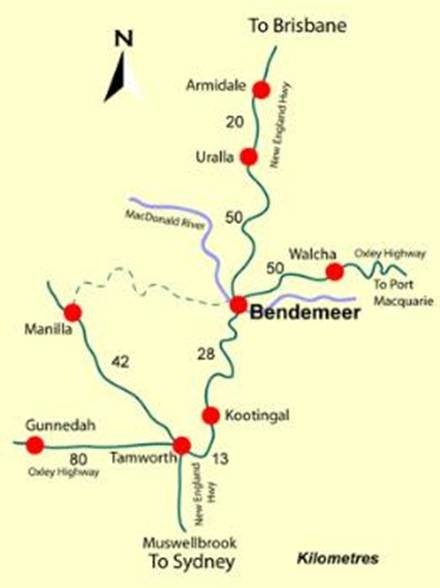 My name is Cassie Baile and I am a fifth generation sheep farmer from Bendemeer which is a village of 485 people on the Macdonald River in the New England region of New South Wales. I have many fond memories of running around in the shearing shed, helping to draft, drench and watching the shearing. We always had few pet/poddy lambs at the house after lambing. It was a great joy to care for them and watch them grow into sheep. One of my most memorable recollections was heading with Dad to check on and/or muster the sheep. I would have been happy to do this every day, 365 days of the year. It is all the wonderful memories and farm life experience that have fuelled my passion for agriculture and in particular the Wool Industry. Following the completion of Year 12 at New England Girls’ School in Armidale, New South Wales, I studied and gained my professional Woolclassers’ Certificate in 2009 through Tamworth TAFE. Following my successful selection for an Elders Traineeship in May last year, I have been provided with on-going support and training from my mentors and the Elders team and this has allowed me to progress to my career pathway in the Wool industry. I now live and work in Sydney, for Elders as a Wool Technical Support Officer at the Yennora Wool Selling Centre. I really love my work and look forward to each day, as there is always something happening. Attending sales both on property and regionally, has enabled me to gain extensive knowledge and skills, interact with clients, improve upon my networking skills and also learn how to process sales and complete buyer registrations. Throughout the past 11 months, I have travelled the state to towns including Newcastle, Dubbo, Cooma and Walcha. Each of these have been a great opportunity to learn more about Ram and Ewe selection, wool characteristics and selling options and also to meet and interact with existing and potential clients. This year, I was also fortunate enough to attend the Sydney Royal Easter Show to network with sheep breeders and take in all that the Sheep and Wool pavilions had to offer. The Sydney Royal was a great experience, which enable me to see some of the highest quality sheep and wool from all over the country on display. Meeting dedicated and committed wool growing families is an inspiration to me as I know it is to the wool industry and wider community. My job with Elders allows me to travel meet and network with farmers in either a hands on way through face to face meetings such as attending on-farm shearings and assisting with ram selection at Studs and over the phone conversations. I particularly enjoy meeting and speaking with wool growers at events like the Newcastle Wool Sales and Industry Functions. 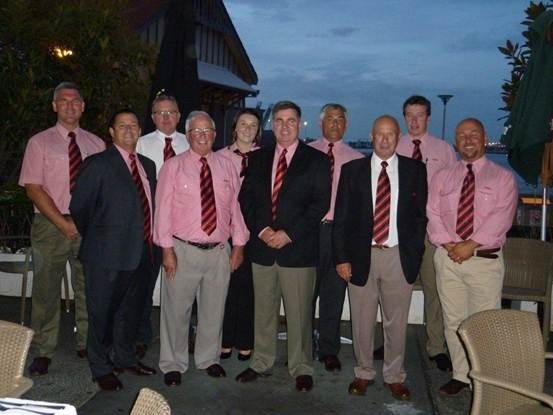 The positive atmosphere at each of these functions is amazing, with like-minded farmers and employees able to interact in a friendly and supportive environment and build upon as well as share their own knowledge of the wool industry. It has certainly helped build my confidence and enabled me to become a more outgoing person. Most recently, I have begun auctioneering at the weekly Sydney Wool Sales. This has been a fantastic opportunity for me to learn the new skill of being a Wool Auctioneer and also to improve my communication skills. Presentation is very important when you are trusted to sell a client’s wool clip. They are trusting you, as their broker and auctioneer, with their annual income and therefore it is very important to know the client and their product well. Its is very important to present the clip and yourself well, to achieve the best possible price for your client and their product. I also help to prepare for the weekly sale through firstly the lotting of the client’s wool specification, the valuing of the samples located on the show floor and by interacting with buyers in order to gain an idea of how the market may perform that week and over coming weeks, depending on supply and demand at that time. 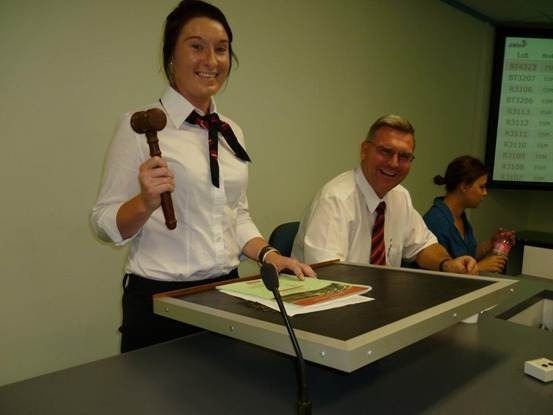 The opportunity to become an auctioneer has been another, very exciting step facilitated by the help and training provided by my trusted mentors within Elders and the industry. Each week I challenge myself to improve my previous weeks’ performance and believe with the amount of support of my mentors, lots of practice and commitment, I have the potential to become a highly valued Wool Auctioneer in years to come. The Wooltrade selling system is an internet-based system trading 24 hours a day, 7 days a week. Wooltrade provides woolgrowers with an alternative marketing system for their wool that is complementary to the traditional auction system. The very nature of the Wooltrade system has opened up the Australian wool market across all states, allowing buyers to purchase wool nationally rather than just regionally. The wool industry has a proud history and plays a pivotal role in providing high quality fibre and clothing to countries all around the world. About 7% of Australian wool is sold by private treaty on farms or to local wool-handling facilities. This option gives wool growers benefit from reduced transport, warehousing, and selling costs. This method is preferred for small lots or mixed butts in order to make savings on reclassing and testing. About 5% of Australian wool is sold over the internet on an electronic offer board. This option gives wool growers the ability to set firm price targets, reoffer passed-in wool and offer lots to the market quickly and efficiently. This method works well for tested lots, as buyers use these results to make a purchase. About 97% of wool is sold without sample inspection; however, as of December 2009, 59% of wool listed had been passed in from auction.] Growers through certain brokers can allocate their wool to a sale and at what price their wool will be reserved. 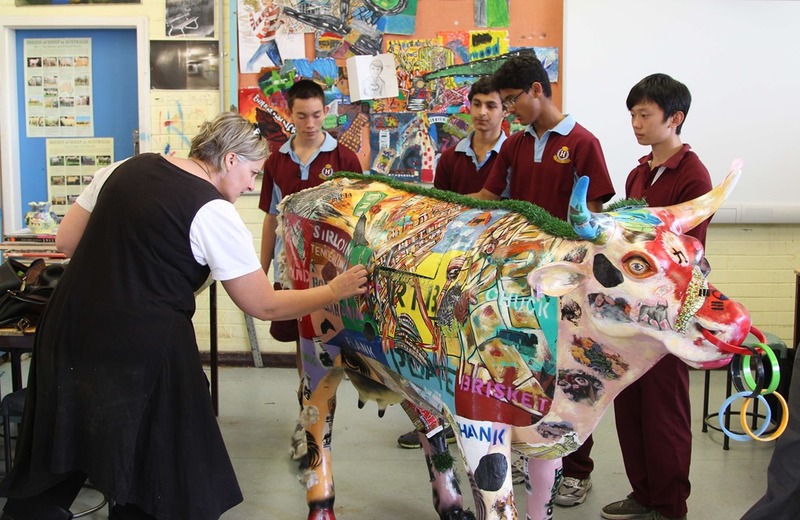 Archibull Prize Judging Day 2…. and more still! 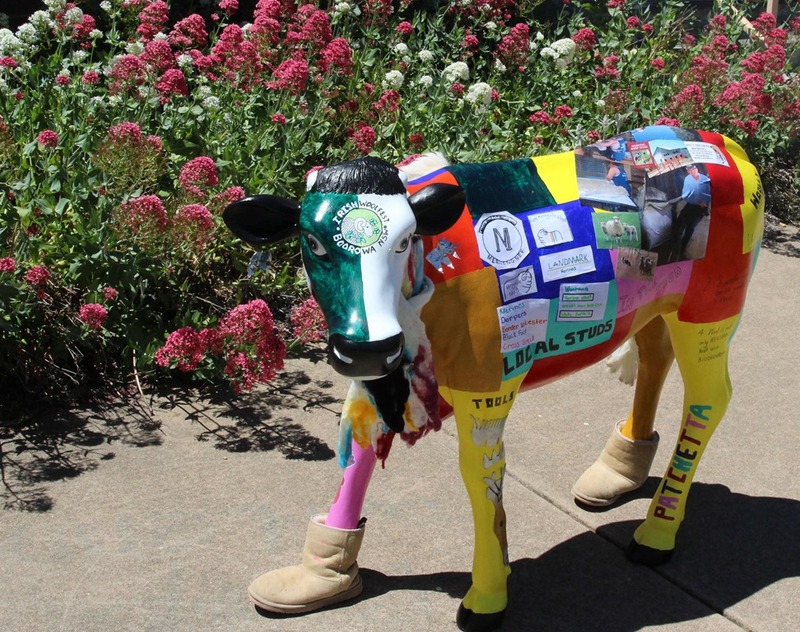 “Missy Moo” has the weight of the wool industry resting on her shoulders. In fact, it is literally built on this poor cow/sheep’s back. 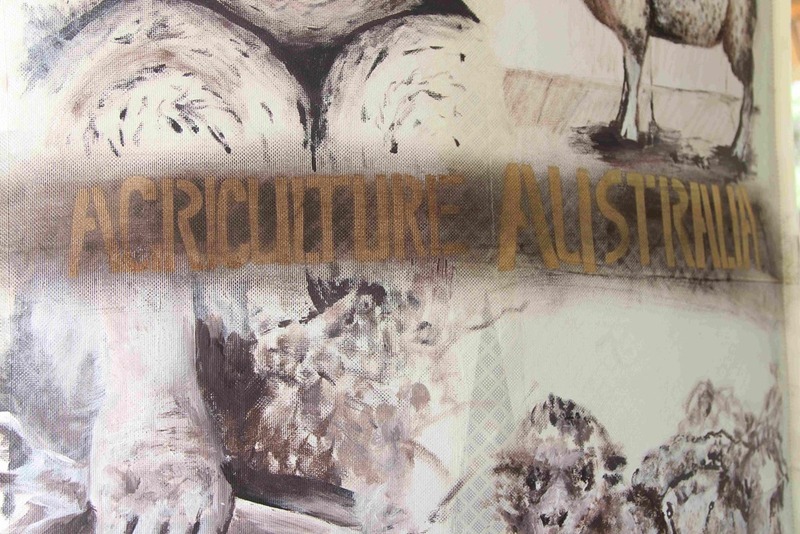 The old fashioned stencilling on the bale reinforces this idea even further. “Agriculture Australia” is literally riding on poor Missy Moo. 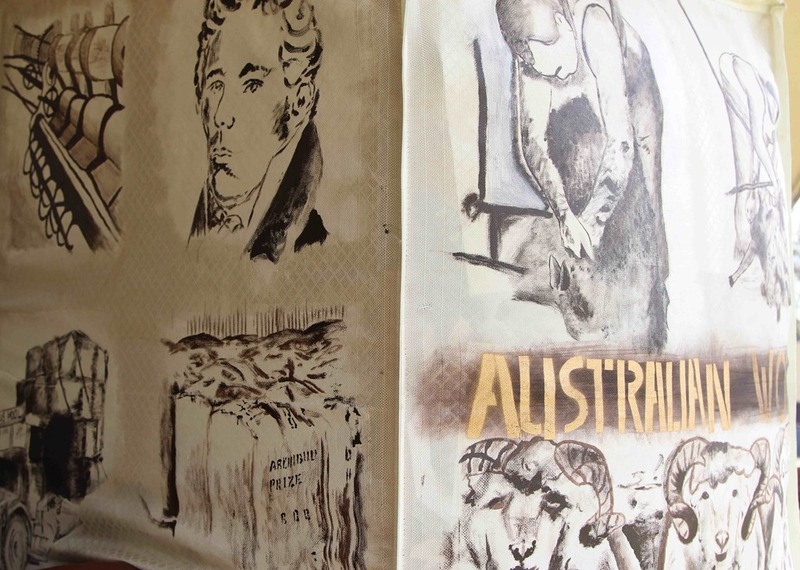 The bale shows some of the history, the processes and the products associated with the wool industry in Australia in soft, subtle sepia tones. 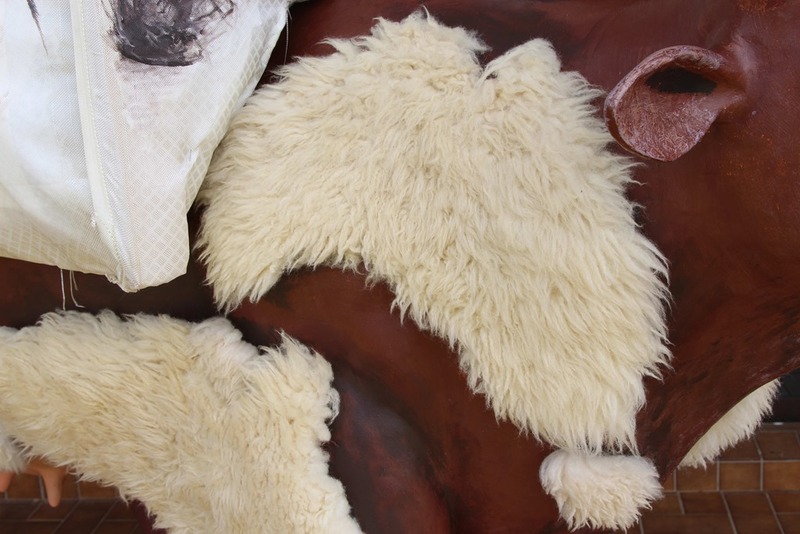 Her body itself, while recognisably bovine, has wonderfully tactile fleece patterning, which, while initially distorted, soon morphs cleverly into distinct, woolly little Australia maps. Author Picture You in AgriculturePosted on November 15, 2012 November 17, 2012 Categories Archibull Prize, Competitions, Young Farming ChampionsTags Australian Wool Innovation, Hills Adventist College, Wool IndustryLeave a comment on Archibull Prize Judging Day 2…. and more still! 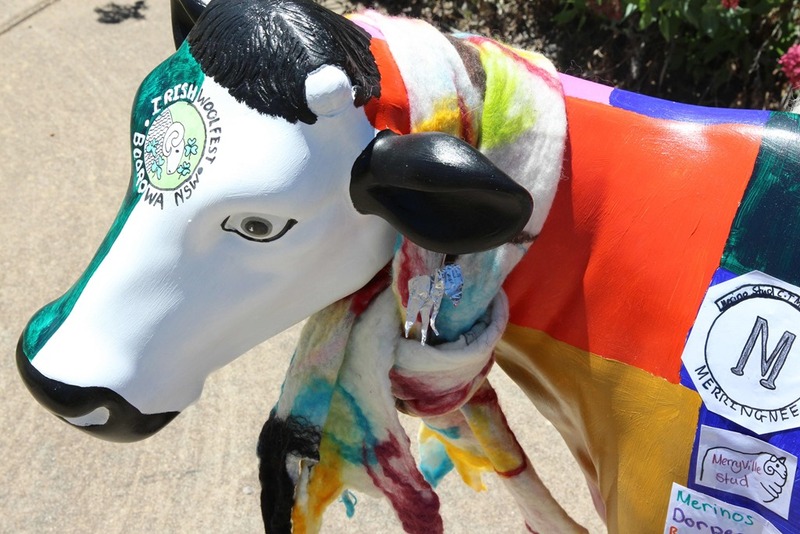 Our next cow also has no name yet… what is it with all of these un-named cows? This is a cow with serious attitude! 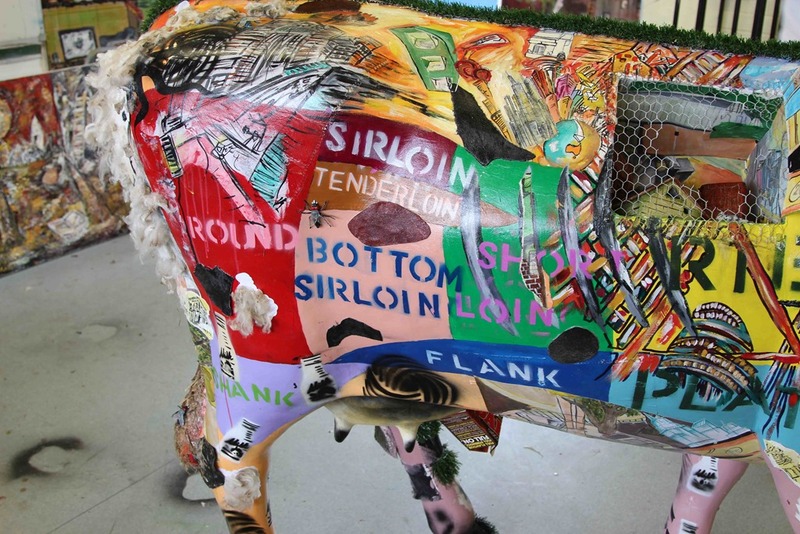 From its synthetic grass Mohawk, to its Olympic nose-rings and graffiti, this cow is distinctly recognisable as ‘urban’. with a subtle nod towards the wool industry. Wendy and the boys ‘discussing’ the cow.